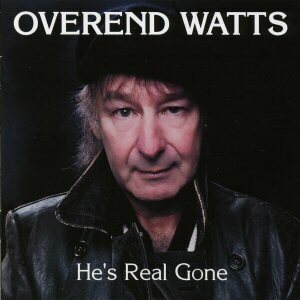 Overend Watts CD: "He's Real Gone"
Overend Watts' solo album has been a long time coming. Something like eighteen years by my reckoning - he first talked about recording an album in issue 2 of Two Miles From Heaven magazine in November 1999. In the intervening years we have been teased with just two tracks - Caribbean Hate Song (on Family Album and Friends And Relatives) and She's Real Gone (on Family Anthology). So has it been worth the wait? Well... yes it has. Many of the songs are inspired by Overend's varied life experiences, either from running his own shop (The Dinosaw Market, Belle Of The Boot) or pursuing his hobby of carp fishing (The Legend Of Redmire Pool). Overend plays all the instruments himself - normally my heart sinks when I read this, but here Overend acquits himself well. Even the drums are inventive rather than perfunctory, as are the keyboards. A true solo album but which sounds like a band - others should take note. Overend promised guitar-based rock in the above interview and while Caribbean Hate Song and She's Real Gone aren't exactly guitar-driver I'm pleased to say He'd Be A Diamond is a strong guitar-based rocker with a decent hook. Redmire Pool is a carp fishing venue. Its precise location was known only to a privileged few, due to the abundance and size of the carp. The song is about the man who caught the biggest fish there (the legend of the song), and Overend imagines his presence next to him as he himself lands a big catch. How can I describe a track like Prawn Fire On Uncle Sheep Funnel? It's... just... plain... nuts! Monty Python meets Spike Milligan meets The Young Ones, backed by The Bonzo Dog Doo-Dah Band. Lyrically it sounds like stream-of-consciousness improvisation, where nothing makes any sense. Madness! But everything else is (thankfully) much more... normal. Tracks like Belle Of The Boot and He'd Be A Diamond more than make up for it. Belle Of The Boot is another guitar-based rocker which is about an attractive lady Overend met at a car boot sale (Overend used to pick up many bargains there which he'd later sell in his shop). Overend has said that when he started writing in earnest (for MOTT's Drive On) he didn't really know about hooks and choruses. I'm pleased to say he has got everything right here, with Rise Up being another strong track with a great hook and chorus. Rise up - before they shoot you down! There's a lot to like here. It took me two or three listens to "get it", but get it I have. Recommended.